A lot of studies have showed the health issues related to the extra burden and the work load that the students are getting. From some of the recent studies and the research materials we have seen that the people have claimed that the assignments and the homework are putting a lot of stress for the students and this is getting their health effected a lot. By the time the students are being pushed to the schools and the teachers are the one that deal with the students assigning them the home work and the assignments. This is good up to a certain an minimum limit but as there are so many of the different courses in the schools and the colleges the students have no choice but to do what are being assigned otherwise the deduction of the marks will be there and this will also effect the overall academic result and the performances of the students. There are some of the cases that have been seen and published related to some schools that the work burden has put on the students so much that they have feel the stress and the tiredness in doing the work. The researchers from the Stanford University have identified that the home work load from the school and the colleges may negative affect the students and their everyday life after the school. There have been the collection of the data from various schools and the colleges and the perception was made on the analysis of that data to say that the work load after the school in the form of the assignments, home work or other academic work can put the students to stress. The data shows that the 56% of the students in the schools and the colleges are affected by the homework and the assignment and this has been one of the main reason for the stress and the anxiety level to be increased for the students. In an open talk with the students from the school and the colleges, numerous students have openly admitted that the huge number of assignments and the work load have made them tired and feel the stress and this is also one of the main reason for the sleep deprivation. Some of the health issue related by the students were stomach problem, headache, weight loss and the main sleep deprivation. There has to be a balance maintained in the quality and the quantity for the academic activities for the students in the school and the colleges and all the way up to the higher education. Teachers are one of the main resources that can be used to build the students with the perfection and made the nourish them and built the abilities to the students that they can be future stars. As far as the assignments are concerned, this is also one of the main and the key criteria for the students to pass the overall academic year. Having the assignments in short intervals is good so that the teacher can have the test of the student and the caliber he has. There has to be few tests taken by the teacher in order for the teacher to see the achievement and the learning of the studies by the students. 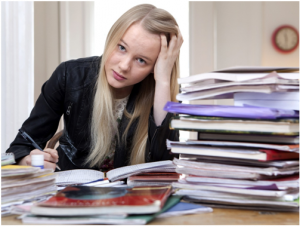 There are cases when the huge number of assignments are given because of the length courses and this becomes a tension and a headache for the students to deal with. In these cases the teachers need to split the work and divide the course in parts and from each part they can make a combined assignment from a few chapters together instead of having an assignment from every single chapter and this will make the student in tiredness. For the students, they have to take the work and a few amount of work less as a part of academic studies and as you progress and made you way to the higher education level, the work load increases and this has to be maintained by the students by having the proper and the time management skills to perfection. If the student leaves all the work till the end and the last days, there will be definite headaches and tension of completing the whole work in last days. So the time and the schedule of the tasks have to be maintained to perfection and this will make the students feel relaxed and achieved the targets and the goals in the right ways. Making a time schedule will make you do the assignments and the tasks before the end line and this will make you tension free and the health and the stability of mind will be there always. Walter Smith is a life coach and a technology entwist; he has written 12 books for school and college students to help them harness the power of technology and create a greater impact on the society through capacity building. In his free time, he works for the assignment writing service to guide the students about the technology writing.